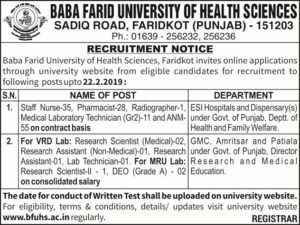 BFUHS Staff Nurse, Pharmacist ANM Vacancy 2019: Baba Frid University Of Health Science Faridkot has Recently Declare a Direct Recruitment Notification For Posts of Staff Nurse, Pharmacist, Radiographer ANM and Other 138 Vacancies. Application Form is Invited Form Eligible Candidates by Online Mode By Baba Frid University of Health Science Official Website. Interested Candidates can check the Post Details Education Qualification, Age Limit, Application Fee, Selection Process before apply Online. The Applicants Go to Official Notification get more Information Regarding BFUHS Recruitment 2019. Education Qualification: The Candidates Must have passed 12th Class Examination, Diploma a relevant field based on pos. Selection Process: The Applicants Will be Selected based on The Written Examination and Interview. How To Apply: You can Apply Online Application Form Through BFUHS Official Website before the Last Date 22 February 2019 For BFUHS Recruitment 2019.